Were you looking for Asbestosis or Asbestos Mesothelioma lawsuits? Asbestos has been added to Drilling Mud, which was used in the oil industry, for decades. 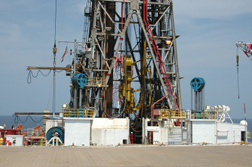 Since the 1960s, such asbestos drilling has occurred both onshore and offshore. Drilling mud composition contained asbestos, which led to mud engineers being exposed to asbestos drilling mud, and the potential to develop asbestos-related disease such as asbestos mesothelioma. Send your Asbestos Drilling Mud claim to a lawyer who will review your claim at NO COST or obligation. Drilling mud is widely used in the oil industry, both onshore and offshore, to help cool the drill bit and flush debris from the well hole during drilling. Beginning in the mid-1960s, asbestos was regularly used as an additive for drilling mud in well-drilling operations by the oil industry. Because of its heat-resistant properties and excellent bonding qualities, asbestos was used routinely as a drilling mud additive, and pure asbestos fibers were often directly mixed into the drilling mud. Many drilling mud engineers in oil fields and offshore oil rigs have been exposed to asbestos oil drilling mud, often unknowingly. Asbestos drilling mud was used widely by oil drilling companies throughout the US, particularly in Texas, New Mexico, Oklahoma, Louisiana, and North and South Dakota. From the 1960s through the 1980s, asbestos was added to the drilling mud, but asbestos-related diseases, (including mesothelioma, a cancer of the lining of the lung, lung cancer and asbestosis) often take decades to manifest and diagnose, which explains why many oil companies are now facing a drilling mud problem, and increasingly, more oilfield workers are filing asbestos drilling mud lawsuits. Many oilfield workers may have been exposed to toxic asbestos products without knowing its harmful, and often lethal, effects. For some, their lives may be cut short due to asbestos mud products. Some oilfield workers remember using a flaky white additive that came in 50-pound bags; they mixed this asbestos into the drilling mud without any breathing or safety equipment. They could also expose spouses and children to asbestos when they came home from work with asbestos fibers on their clothing. The two drilling mud brands that were mainly used were Flosal and Visbestos: both products were packaged in 50 lb. bags and were used for sweeping the hole as a viscosifier. Flosal and Union Carbide asbestos products were originally IMCO Shurlift and IMCO Best products and relabeled. IMCO, an asbestos mud defendant, has been afforded bankruptcy protection under the 2003 asbestos bankruptcy. Flosal was sold between 1964 and the mid 1980' by Drilling Specialties Company, which was a division of Conoco Phillips. Visbestos was sold by Montello during the 1960s; the company joined Union Carbide in the late 1960s and it is believed that the product was distributed by drilling mud companies as late as 1989. Visquick was a pure asbestos product. The manufacturer, Magcobar, is also part of the 2003 bankruptcy relating to asbestos products. As well, asbestos-containing materials (ACM) were often used to insulate oil workers' protective clothing due to fire dangers often present in oil fields. If these fire suits were worn out or torn, workers could be exposed to asbestos fibers through their 'protective' clothing. Although some asbestos manufacturers have claimed bankruptcy (such as IMCO, above), the law states that, when a company is bought by another, generally the liabilities and claims against that first company are also bought. Therefore, lawsuits can still apply against many asbestos product manufacturers, distributors and sellers, but also against offshore employers under the Jones Act and maritime law. Many asbestos claims are difficult to win—not because of medical reasons, but because most victims are forced to file product liability suits against the asbestos manufacturers. Workers on semi-submersible drilling rigs, jack-up oil rigs, offshore oil platforms or other maritime vessels can file a lawsuit directly against their former employer for any illness or injury which occurred while working offshore under the Jones Act. This act is a powerful statute that favors the worker against his former employer. Claims under the Jones Act and maritime law may be filed straight against former employers, rather than filing against bankrupt asbestos producers. The Jones Act and maritime law applies to workers if they worked offshore or on drilling barges on the water, and claims can be filed directly against past employers for any asbestos-related exposure that a worker may have experienced while working for these past employers, including oil rigs in the Gulf of Mexico and drilling barges which operated from the 1960s through the mid to late 1980s. Many oil field workers have already been diagnosed with asbestos-related diseases, including mud engineers, mudhands, roughnecks, floorhands, shakerhands, drillers, and assistant drillers. An asbestos widow was awarded $1.2 million as settlement of a lawsuit she and her husband, Danny Puckett, brought against Dowell Company, his former employer. Mr. Puckett was a member of the cement crew between1975 and 1985. He was exposed to asbestos during that time and died from asbestos mesothelioma. In another asbestos mud case, a Mississippi jury awarded $15 million to Troy Lofton, a 71 year-old oil industry worker who developed asbestosis after years of handling bags of product containing 99 percent asbestos. Plaintiff Troy Lofton, who testified at trial with tubes in his nose and ears and holding an oxygen bottle that assists his breathing 24 hours a day, claimed that Conoco Phillips manufactured a dangerous product while knowing of its dangers. Although a drilling worker's exposure may have happened years ago, the chemical companies that manufactured the asbestos and the oil companies who exposed their workers to the asbestos may still face liability today. 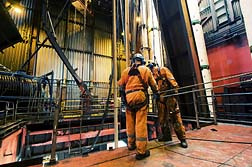 Workers who were exposed to asbestos while working with gas or oil on an oil rig, oil platform, or other structure may qualify for compensation under maritime law. If you worked in a drilling operation in the 60s, 70s, or 80s and believe you may have been exposed to asbestos, you should contact an asbestos mud attorney who can inform you of your rights without delay. Mid 1960s: Asbestos is added to offshore and land based drilling muds. 1970': Asbestos is prohibited by the US government, but offshore companies take the position that these laws do not apply to their oil rigs or inland drilling barges. 1980s: Asbestos continues to be added to oil drilling mud, up until 1989. October 5, 2009: the first drilling mud additive verdict is reached in Texas. Montello, Inc. and Union Carbide were each assessed 15-percent liability of the $1.2 million award for causing Mr. Puckett' mesothelioma. Oklahoma law was applied to this case. April 20, 2010: A Mississippi jury awards $15 million to a 71 year-old oil industry worker who developed asbestosis after years of handling bags of product containing 99 percent asbestos. If you worked, or are presently working in the oil industry offshore or onshore, it is possible that you have been exposed to asbestos and may not even know it. Asbestos Drilling Mud Lawsuit: Workers “Looke.. 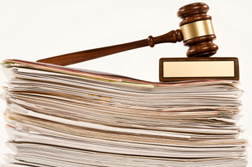 Plaintiffs and Defendants Locked in Asbestos ..
Australian Driller Takes Asbestos Drilling Mu.. I have recently been diagnosed with asbestosis. I have been on oxygen at night for 3 years with breathing machine. Never connected this with my work in the oil field until contact with others who informed me of this. I started working in the oil fields in high school in mid sixties and worked full time in fields until 1973 as derrick man who mixed the mud. I remember putting these mixtures in mud hopper all the time and getting it all over me. I also worked offshore for Penrod Rig 61 as derrick hand. This can be proven by my work history. I cannot do much anymore as I am constantly out of breath, cough all the time, have not energy etc. My father passed away from lung cancer in April of 2014 and he worked in the oil field in the ’60s, ’70s, ’80s and ’90s. My family thought I should contact you.